“It’s satisfying when you do a good deed for people who have suffered so much,” said Maritsa Mavrapidi, one of the now famous grandmothers of Skala Sykamias, to the Ode to Lesvos mini-documentary. Mavrapidi and her friends Efstratia Mavrapidi and Militsa Kamvisi became known around the world after they were pictured holding the baby of a refugee after she arrived on the island. As the grandmothers, once refugees themselves, explain in the film, they also washed refugees’ clothes and provided them with any food they could. “What else can you do? You can’t stand by and watch when things like this can happen,” said fisherman Stratis Valiamos, who was also nominated for the Nobel Peace Prize, which in the end was awarded to Colombian President Juan Manuel Santos. “Tomorrow that could be me. Tomorrow I might have to get a boat and leave, and have my baby on board. Wherever I’d end up, I’d want someone there to help me,” added Valiamos. It is exactly this lucent combination of altruism and empathy displayed by so many locals on Lesvos and other Greek islands that shone through the dark days of last year, when a country already rattled by the dramatic developments flowing from its economic crisis found itself being the first port of call in the biggest flow of refugees in to Europe since the Second World War. More than 850,000 people arrived in Greece by sea last year, many of them reaching villages that only had a few dozen inhabitants, who would have had every right to be overwhelmed by this sudden upsetting of the quiet balance on their islands. Yet, the stories of bravery and generosity abound. Another fine example can be seen in a short documentary called 4.1 Miles (the distance by sea from Turkey to Lesvos) by Daphne Matziaraki, which follows a Greek coast guard captain and his crew as they perform rescue after rescue in harrowing circumstances. The film is a searing study in the contrast between the anguish of the refugees who are plucked from potential death and the determination of captain Kyriakos Papadopoulos to rescue them. Like the other islanders, the coast guard skipper also just sees himself as a man doing his job, albeit in extraordinary circumstances. However, it is in the moments when he is not performing these tasks that the toll of long hours, difficult conditions and human suffering is visible. 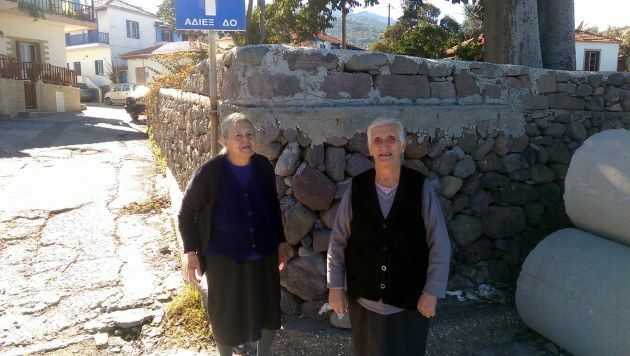 After so many years of struggling to find something they could be proud of, the stoic way in which so many islanders, like Mavrapidi, Valiamos, Marmarinos and Papadopoulos, reacted when they were called upon, Greeks now have something to inspire them. However, this is far from just a Greek affair. As it loses itself in its existential crisis, perhaps Europe can also look upon what has happened on the Greek islands and draw some hope. The refugee crisis has brought out the worst in the European Union: fear, pettiness, political cowardice, nationalism and bureaucracy. But it has also brought out the best, and the places that this has probably been most evident is on the Greek islands. It is here that Greeks prepared to be selfless have worked alongside Spanish volunteer lifeguards, French children’s entertainers, British women washing refugees’ clothes, German activists cooking food and countless teenagers from other European countries who have felt the urge to travel to Lesvos, Chios, Samos and other islands to help in any way they can. At times it has been muddled and chaotic but when everything is stripped away there is something exhilarating about Europeans coming together free of concerns about borders, nationalities, policies or voters and giving their all for no other reason than fellow human beings being in desperate need of their assistance. Of course, the refugee challenge that Europe is facing is complex and viewing it just through the ethical prism is not likely to lead to an integrated and well thought-out response that gives migrants the best chance of rebuilding their lives away from the horrors of war. However, any response has to start with the ability to show compassion at the cutting edge of this crisis. There is much mental anguish within Europe at the moment as we try to answer questions such as “who are we” and “where are we going”. We are searching high and low for Europe’s heart in the hope that we can look at our futures and continent with some confidence again. Perhaps, though, we are searching for it in the wrong places. Maybe what we are missing is right there on the EU’s outer edges, the shores of Skala Sykamias, where people made the extraordinary ordinary and sought no reward or prize in return. This is an impressive laudation to the people of the Greek islands which helped and supported the refugees to survive. It's deplorable that they didn't get the Nobel Peace Prize. But in a way this laudation is more than the prize itself ever could be.